Despite his rough exterior and angry bad boy attitude, Glenn Danzig put smiles on hundreds of faces at the Wellmont this past September. It goes without saying, but Danzig’s following gave the local hero a warm Jersey welcome as they anxiously stood wrapped around the block totaling enough metal studs and apparel to conquer a small city. Touring in support of his newest release, “Black Laden Crown,” Glenn no doubt kept to his notorious high standards regarding opening acts. Another superstar tour paraded young(er) guns: Mutoid Man and Corrosion of Conformity. There was not a dull moment as both bands did their job by exciting the crowd and maxing out the enthusiasm. Danzig made it to the venue just in time for his set, which he killed. Starting on the right foot with “SkinCarver,” the audience was captivated from the first growl and continued to display their moshing zeal right into the classic, “Twist of Cain”. “How the Gods Kill,” “Dirty Black Summer,” and “Last Ride” were all highlights of the show. There was no stopping the vehement shock of an innocent bystander each time a wild mosher piled into them. But with that being said, is there such a thing as an innocent Danzig fan? Doubtful. Rightfully so, the show went on just as expected, loud, energetic, and violent. The news broke a few short days ago but with the holiday weekend looming I had other things in queue for you to read. I snagged two news items from the main mans official website and culled them together for your maximum Metal enjoyement. Dig in. DANZIG have been announced a Handful of Shows for the East Coast to coincide with their Riotfest 2017 Appearance. These will be the Only 2017 Live Shows for the East Coast. He also recently announced that this Riotfest appearance will find him playing the ground-breaking “DANZIG III How The Gods Kill” Album. 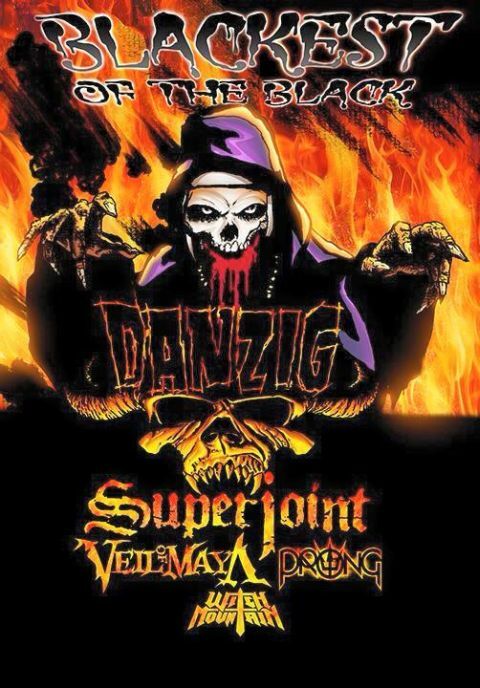 The Set will also include Songs from the New Red-Hot “Black Laden Crown” & Classic DANZIG Tracks. Danzig brings his “Blackest Of The Black” tour to NYC at the newly christened Playstation Theater. Featured artists include Superjoint, Witch Mountain and more. It’s going to make some Metal heads day for sure as Glen Danzig announced the news about his “Blackest Of The Black” tour package was returning the other day and just released the full itinerary a short time ago. I’ve snagged the poster and the words scribbled on the Official Facebook for your indulgence and shall return with thoughts after that.